Hooked on Needles: Impromptu Quilt-Along ~ I couldn't resist! This pattern calls for twelve 10-inch squares of fabric and 60-something 5-inch squares, and then a bunch of background yardage which I just happened to have still on the bolt leftover from a previous project. So I went through my stash and picked out twelve pieces for the big squares. Then I went through my pile of 5-inch squares acquired from the many swaps I did over the past many years and picked out about eight squares each from eight different color families. 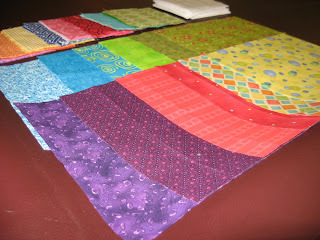 So every print fabric will be different, kind of like the prints I chose from the swap squares for my rainbow quilts. I've been spending some time in my sewing room over the past few days and have made quite a dent in this project, so stay tuned for more pictures. I love how all the mixed up colors and prints and the white background make for such a happy quilt! Of course Rachel's pattern helps with that too! Feel like a fun summer quilting project? Join this quilt-along!